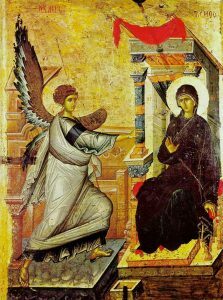 The icon of the Feast of the Annunciation of the Theotokos, celebrated this month on March 25. It’s odd writing “From the Rector’s Desk” while on vacation. It sounds like I’m working on holiday. But, I’m not sitting at my desk. It’s refreshingly warm in southern California as I gaze out the window at palm, banana, and avocado trees while oranges grow in the neighbor’s front yard. In fact, it feels like late May or perhaps early June in State College with different flora. This is not to engender envy in the flock at the beginning of Lent. It means, however, that I will face the arduous journey of the Fast renewed in body and consequently a bit renewed in spirit, too. Shepherds need waters of rest, just like their sheep. Repentance is at the door and Lent truly is that period which brings great profit to our souls. Let us prepare to take the next steps together. Let us begin the Fast with joy.